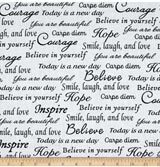 Oklahoma Twister Quilt Designs - 10 design ideas to inspire you! 10 patchwork ideas to inspire you! 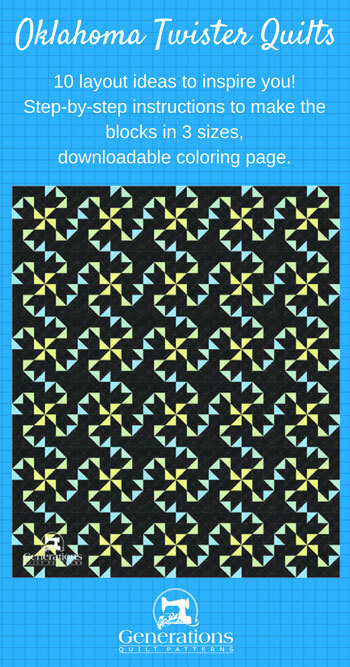 The Oklahoma Twister quilt block--with all its twirly-swirly goodness--offers some interesting design challenges. 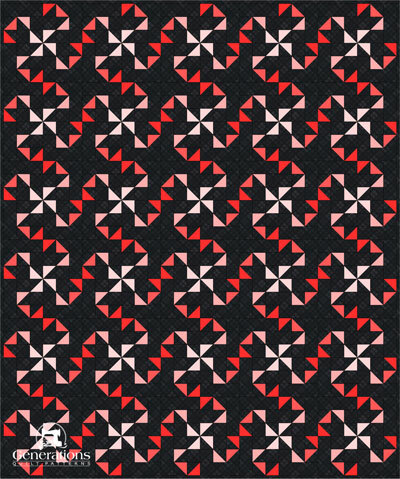 What will it look like in a quilt? On this page you'll find 10 different layout ideas—both straight and on-point layout ideas—plus a couple of different colorings to get your creative juices flowing. Or will you create your own? 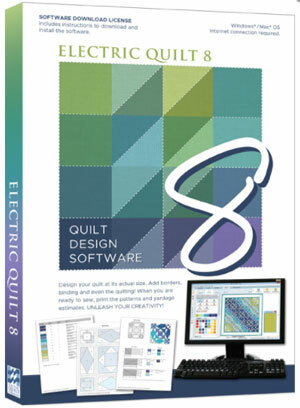 All of the illustrations on this page were designed using Electric Quilt 8 (EQ8), a quilt designing software program. The box contains a software download license—License ID and Password—and a booklet to get you through installation and get you started. There is no disk as in the past. Download the software onto your computer from the EQ website using the ID and password as directed. At the time of download you can choose either PC or MAC. 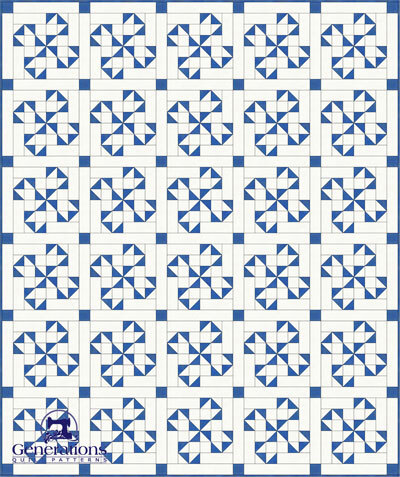 In this first layout, our Oklahoma Twister blocks are in straight rows and columns of 5 by 6 blocks. There's a a whole lotta of shakin' going on, isn't there? Lots of movement. Your eyes roam across the patchwork. Did you notice how there's no secondary, 'surprise' design forming at the corners where the blocks meet? That's because there's no piecing in the corners. 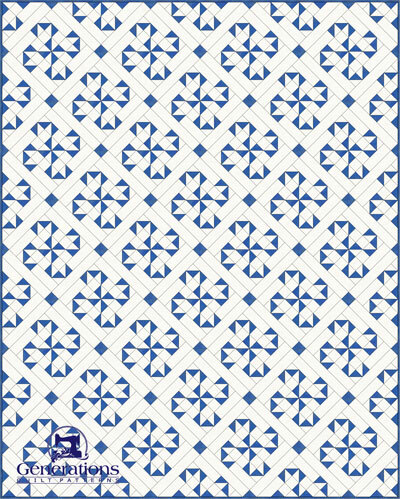 Though a nice little bow tie does form at the center of each side where the blocks meet, it doesn't draw your attention. Too much competition from all the visual movement. Usually I omit the drawing lines between the units in a block and the blocks, themselves, to get a real good look at the design. Here, I've left them in purposefully to show that while this next idea looks almost the same as the first, the Oklahoma Twister blocks are actually set edge-to-edge and on point. With so little different between straight and onpoint layouts, I'd opt for the straight set version simply because there's far less piecing—no fiddly setting triangles to piece. Back to straight sets, now with simple sashing and cornerstones. Easier to piece than the first two options because there's no matching of seams between the blocks. 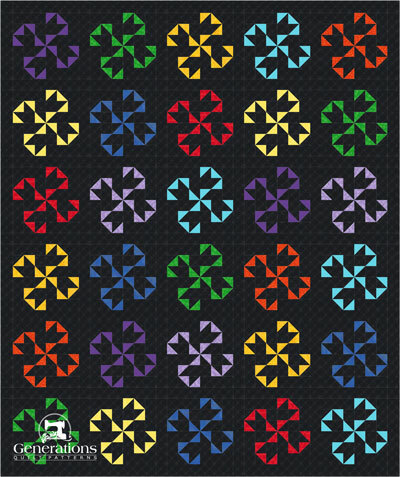 The price of less piecing, though, is a more static design . ...though out of the corner of your eye you might start to see some curving. Love that illusion, but it's not enough to save this Oklahoma Twister idea. Swapping in a solid, darker alternate block substantially cuts down on piecing-time. 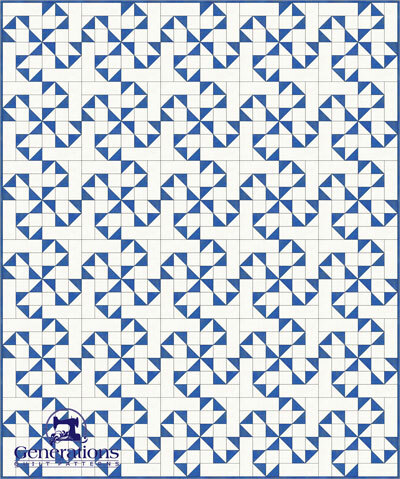 The trade-off is that you've now got some significant quilting to do to fill in those larger empty space. 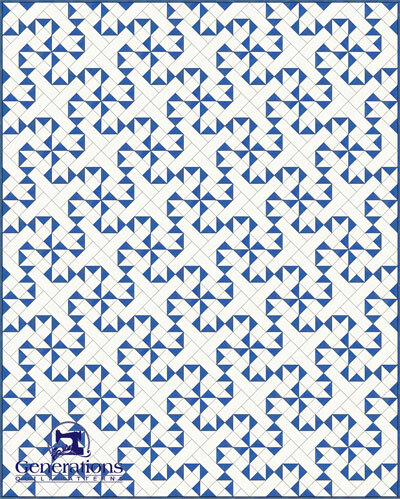 If you like to machine or hand quilt, this variation may be perfect for you. Maybe even lose those dark cornerstones altogether. 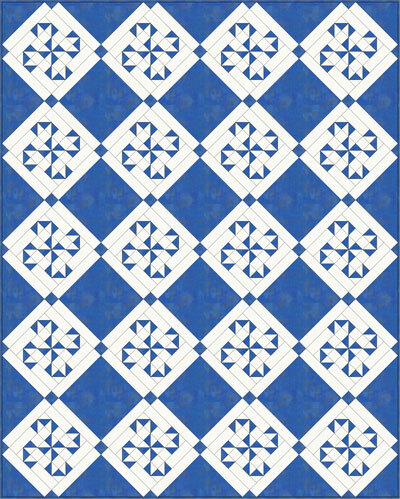 I've removed all the lines between the blocks and patches to give you a better feel for the finished design. A modern variation. Lots of negative space for quilting. The blocks almost seem lost in all that white space. The two-color or two-fabric options shown so far are all nice (the first one is my favorite). 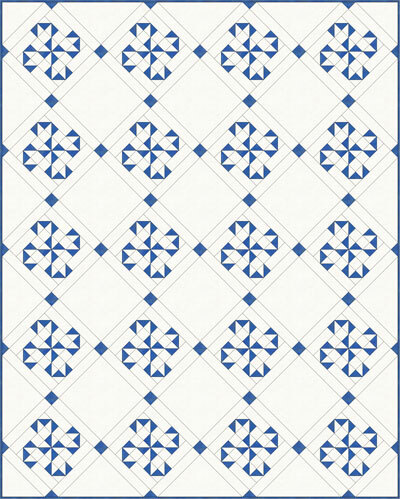 Without any piecing in the corners, not much is going to happen design-wise. That means we'll need to play with color to jazz things up. 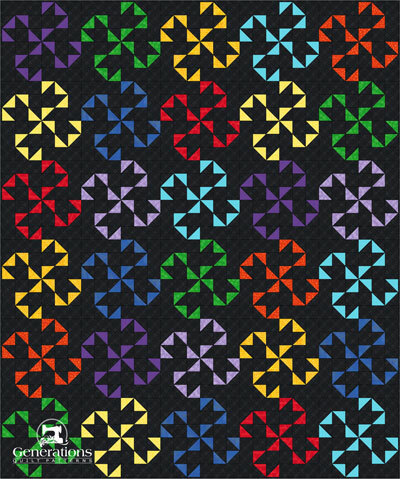 A dark background with brightly colored blocks completely transforms the pattern. Dark sashings and cornerstones provide the space between the Twisters that laid out in straight rows and columns. 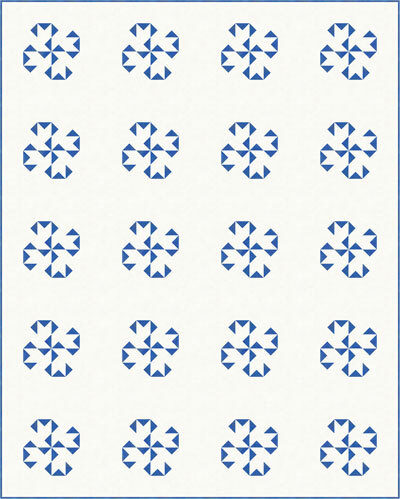 Looks kind of like flowers. Remove the sashings and cornerstones. Interestingly, the abrupt change of color at each block's edge minimizes the swirly-twirly movement of our original, two-color straight set. It's still there, just muted. Now keep the dark background and add a gradation of color. Here we've graded the Oklahoma Twister fabrics from a light pink in the center of the pinwheel out to a darker orangey-red. This is perfect for hand-dyed fabrics or some of those ombres on the market today. 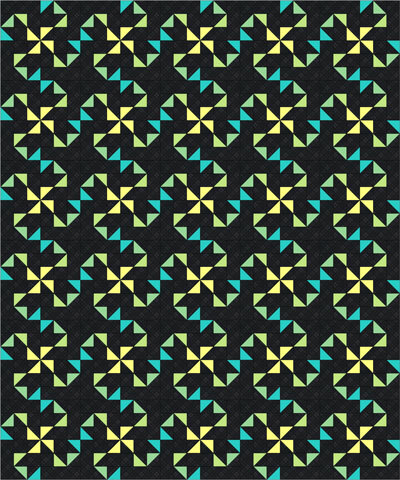 That makes me wonder if the motion is dependent on a two color quilt? 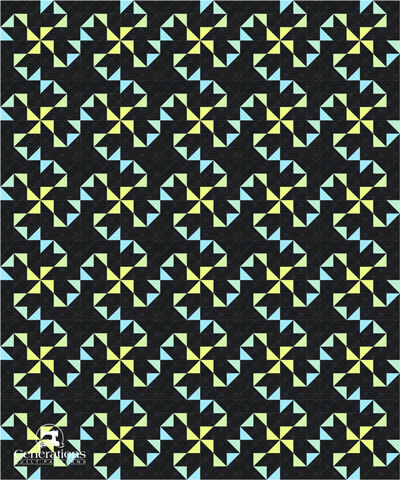 The example below shows a gradation of the Oklahoma Twister fabrics from a pale yellow to green to blue green to blue. But let's increase the intensity of the yellow center just a bit. It's a subtle difference, but I like this better. The yellow gives a bit more focus to the design. Remember, though, it's not what I think, but what YOU think! 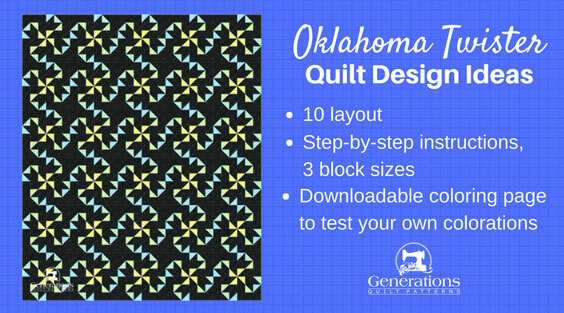 Is an Oklahoma Twister quilt in YOUR future?